The tender, transforming power of making. Hello! Meet Blossom! She sprung from my sketchbook into a mixed media piece that I am actually really proud of. I was inspired by Gabrielle Pollaco- I think her mixed media video tutorials are wonderful and I've learned a lot from her. What a wonderful age we live in when we have instant access to so much amazing inspiration and learning! 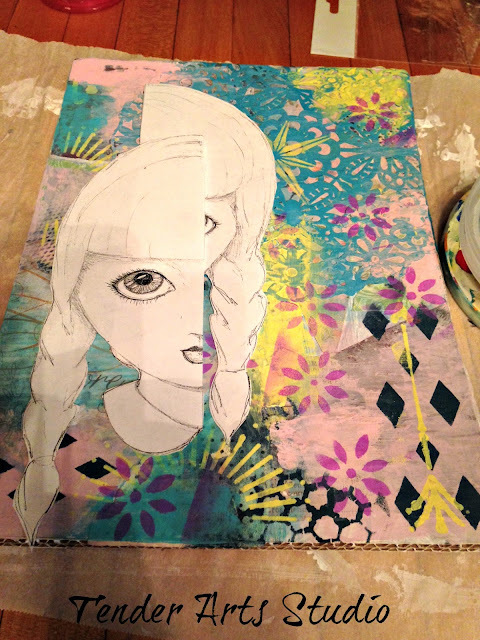 Anyway, I was watching this video where she added a paper doll piece that she made herself to a mixed media canvas and something just clicked for me. I'm always sketching and sometimes I really like the things in my book and feel disappointed because it is just stuck in a sketch book instead of being something that I feel I can display. 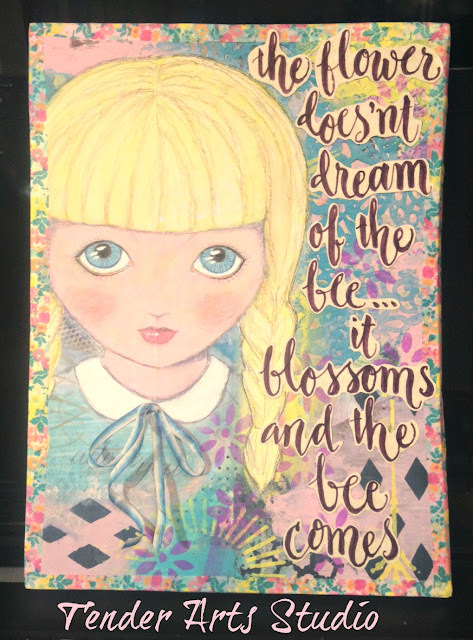 I had this little cutie in my sketchbook and, inspired by Gabrielle, I photocopied the page and then built a canvas to decoupage her into. Of course, my "canvas" was just a piece of corrugated cardboard, but you know what I mean! Initially I could not see how she could fit on the canvas so I cut her in half thinking I would just use half of her- similar to these ATC's I made a while back. However, after playing around with it for quite a while, it became obvious that more of her would fit than I initially realized. Unfortunately, I had only the one photocopy, so I just glued both halves down on the canvas and, in the end, I don't think it is obvious. I finished off the edges with a floral washi tape that matched everything perfectly and added a sweet little neck tie made from an ombre ribbon. I hand lettered the quote on parchment paper using a purple Tombow brush marker, fussy cut the words and glued them onto the final piece. 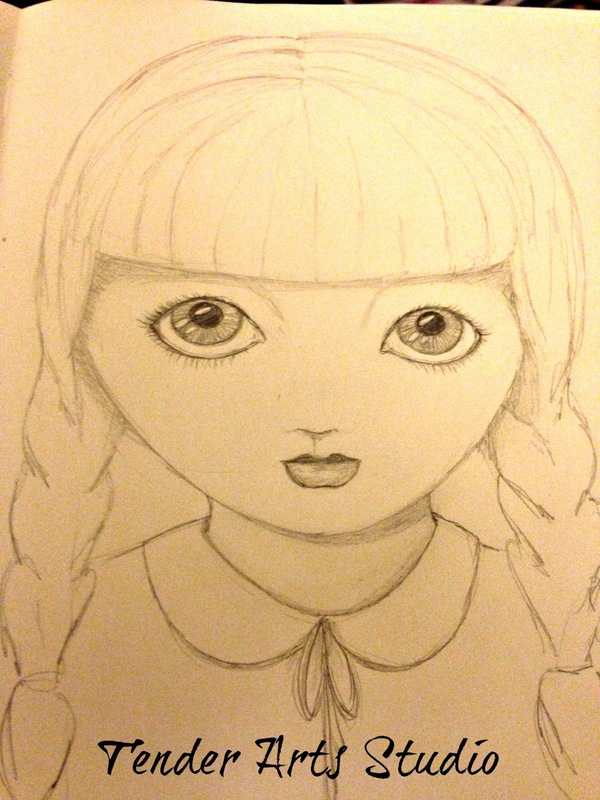 I think she is sweet and slightly vintage looking. She also kind of reminds me of Jenny and Aaron's work with her bright blond hair and cute braids. Anyway, I like her and I want to make more! My first project as an Ephemeras Vintage Garden Design Team Member! Free Little Bird Pattern for You to Sew!